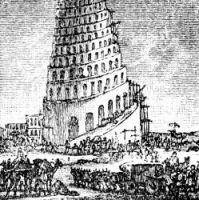 The Tower of Babel is only mentioned once in Scripture, and then as incomplete. It was built by the people of Babylon who had become arrogant and presumptuous and defiant of God. It was constructed of bricks and bitumen and was meant to be tall enough to reach the heavens. God knew he had to chasten the self-assertive spirit of His children. He came down among them and punished them by taking away their power and destroying them as a nation, and scattering them over the face of the earth. 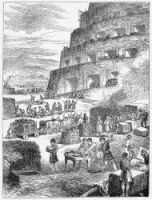 The Tower of Babel and the great walled city by which they had hoped to perpetuate their strength, plunged them into dissension. They quarrelled over their work and grew mutually suspicious. Faslehood was bred in the world, and a man's tongue no longer spoke the language of his heart. 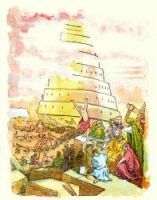 This series of images depicting the Tower of Babel are from my collection of antique Bible books. Feel free to use these pictures of the Tower of Babel in your artistic creations. Click on the Tower of Babel illustations below to see more details about saving a free Tower of Babel image or about purchasing the images about the Tower of Babel at a higher resolution.